Dillian Whyte vs. Luis Ortiz? 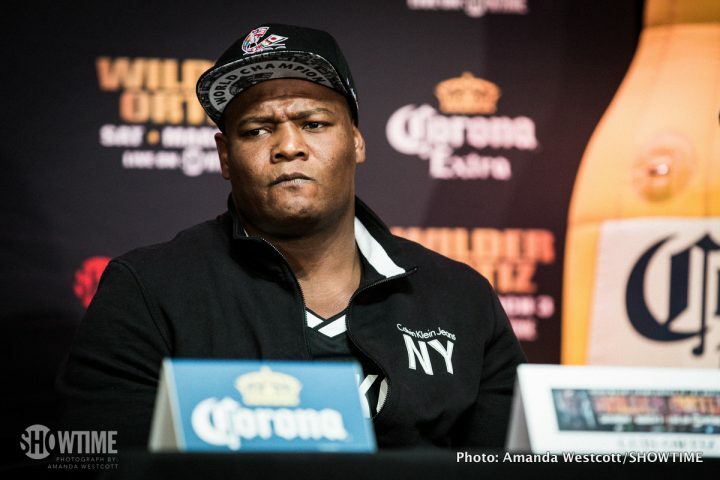 By Tim Royner: Dillian Whyte (23-1, 17 KOs) will be fighting southpaw former heavyweight title challenger Luis ‘King Kong’ Ortiz (28-1, 24 KOs) in a WBC heavyweight title eliminator or July 28 at a still to be determined venue in the UK, according to ESPN. The winner of the Whyte vs. Ortiz fight will be the mandatory challenger to World Boxing Council heavyweight champion Deontay ‘Bronze Bomber’ Wilder (40-0, 39 KOs). The Ortiz vs. Whyte fight will be officially announced by Matchroom Boxing USA promoter Eddie Hearn in a news conference on Thursday. Whyte, 29, had two options to fight in an eliminator. He could fight for the IBF title eliminator against Kubrat Pulev for a 75/25 split or face the arguably more dangerous 38-year-old Ortiz, but make more money in that fight. It’s unclear whether this is a secondary title eliminator or for the main mandatory spot, which is supposed to be held by Dominic Breazeale. The IBF eliminator would put the winner of the Whyte vs. Pulev fight as the mandatory challenger to IBF heavyweight champion Anthony Joshua. Whyte already lost to Joshua 2 ½ years ago by a 7th round knockout in December 2015. Whyte has won his last five fights since then to get ranked #1 with the WBC. Two weeks ago, Epic Sports & Entertainment won the purse bid for the Whyte-Pulev IBF title eliminator. That was a surprise to some that Epic Sports were able to outbid Hearn and his Matchroom Sport promotional power house with a bid of $1,500,111. It makes you wonder whether Hearn believed that the Whyte vs. Pulev fight was necessary to put in the winning bid, because he likely could have bid enough to win the bid. Ortiz lost to Deontay Wilder by a 10th round knockout on March 3 in a competitive fight that saw both fighters badly hurt. Wilder, 32, barely escaped the 7th round after getting nailed with a left hand to the head. Whyte is taking a considerable risk in choosing to face Ortiz in the WBC title eliminator rather than facing the lighter punching 37-year-old Pulev in the IBF eliminator. Both guys are tough with tons of amateur experience, but the Cuban Ortiz brings a lot of punching power, experience and a southpaw stance. Whyte recently said that he would have no problems beating Ortiz, who he says is an “old man” and not at his best. We’ll have to see if that’s the case or not. Whyte hasn’t been fighting tough opposition for the most part during the last couple of years. Whyte’s hardest fight since his knockout loss to Joshua was his fight against Dereck Chisora, who he beat by a questionable 12 round split decision. The boxing world felt that Chisora deserved the victory on the night. Since then, Whyte has taken it easy, beating Robert Helenius, Malcolm Tann and Lucas ‘Big Daddy’ Browne. Whyte is going to have a chance to back up his trash talking that he’s been doing lately about Ortiz. If Whyte can beat Ortiz in a more impressive fashion than Wilder, it’ll say a lot about him. Boxing » Deontay Wilder » Dillian Whyte vs. Luis Ortiz?